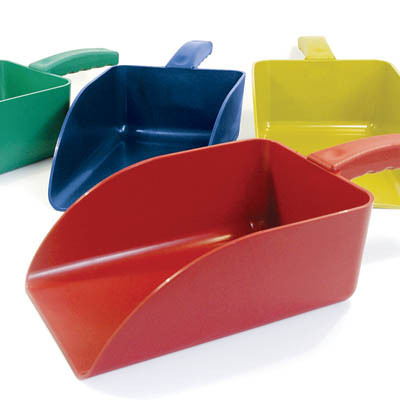 Metal Detectable Large Scoops - MD42 The Detectable Hygiene Range has been specifically developed for the food processing industry and adds a new dimension to the claims of using "all due diligence". These products are all produced from a specially formulated material based on high impact food contact approved polypropylene. This material has the ability to be detected and rejected by typical metal detection machines used in the food processing industry. 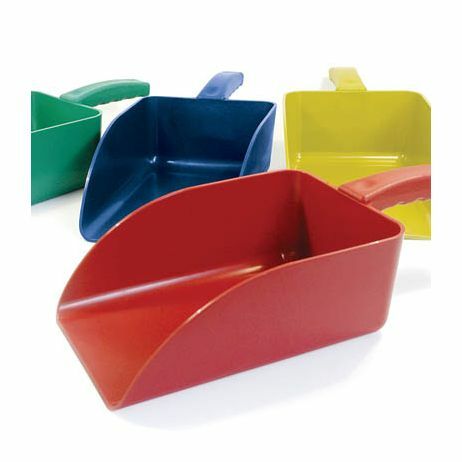 Scoop Dimensions 6.5" x 9" x 13.9" .72 lbs. - 35 oz. Features: • Food contact certificates held • Particles are detectable and rejectable by most metal detection machines • X-ray visible • Prevents damage to delicate and expensive equipment • Cost effective against stainless steel • Tough and durable • Easy to clean • Virtually unbreakable • All Tools come in Blue , Green , Red , Yellow , and White. * * Some tools are only produced at varied times during the year, please call for availability. All metal detectable tools are produced from a specially formulated material based on high impact food contact approved polypropolyene. FDA/EU Approved.